Señor Neil Murphy opened his first chocolate kitchen and store in a long, narrow adobe building in Sena Plaza, Santa Fe in 1971. Señor Murphy, a fourth generation candy maker from Dublin, Ireland, devoted himself to creating confections that fused old-world traditions and techniques with indigenous New Mexican ingredients such as piñon nuts and chile that make Senor Murphy's chocolates so distinctive to this day . Señor Murphy's commitment to quality chocolates and confections is only possible through the work of our dedicated staff, many of whom were trained in our first Sena Plaza store, and who maintain an allegiance to traditional cooking techniques. All of our toffees, brittles, caramels, and fudges are hand stirred in copper kettles to ensure that the taste and texture meet our standards, and that the batches are small and fresh. Whenever possible, we use local ingredients from small businesses that are as committed to quality as we are. 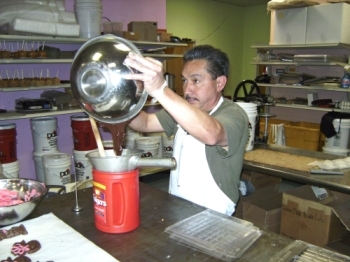 Nearly four decades after opening our first store, Señor Murphy chocolates are still crafted by the same dedicated confectioners, though in a larger location in Santa Fe. Though our line of products has greatly expanded and we have several retail locations in New Mexico, our dedication to our recipes and hand-made techniques remains strong. You can find it in our buttery caramels, our smooth dark chocolate, or the spice of chile that lingers on your tongue: every bite of Señor Murphy's chocolate is a savory indication of our commitment to our chocolate and to our customers. So whether you're looking to give your inner child a treat with a crisp caramel apple, or your mature taste buds are screaming for dark chile pistachio bark, look no further than Señor Murphy's, Santa Fe Candymaker extraordinaire.